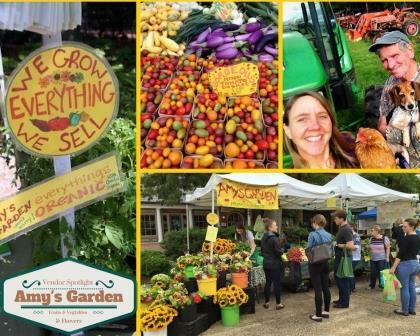 Amy’s Garden has been growing and selling great organic produce, plants and cut flowers since 1995. What began as an ambitious backyard hobby garden quickly blossomed into a full time farming career for husband and wife team Amy Hicks & George Ferguson. With the help of seasonal employees they now grow an amazingly diverse selection of vegetables, small fruits and cut flowers on their organic farm in historic Charles City County, VA.